knit and tonic: My Favorite Christmas Present, Ever. My Favorite Christmas Present, Ever. It's a good thing I didn't finish any of my Christmas knitting except for that exceptionally tiny beret that ended up fitting my sister perfectly. It's a good thing because I am convinced that all that jazz about the big Christmas Knitting Deadline and the Will it Fit/Will They Like it Debate fluffs up the project so much in our minds that if, when the recipient finally opens their gift, they have a heart attack and go totally blind from from the joy of it all that our knit-gifting experience will never be exactly what we expect. I mean, really, let's be honest. A heart attack and total blindness--add to that a small amount of some sort of incontinence or maybe a swoon or two would fall just a tiny bit short of what we'd expect, once we add up all those skyscraper dreams, etc. that we graft into all those stitches, bulky or not. Anyhow, like I said, it's a good thing I only finished one item. Or should I say, I only finished one knitted item. Seems, I finished a five pound or so jar of pistachio's, too, and I didn't realize until today that those pistachios are how residing on my belly and where my biceps used to be. I swear, there were five people in this house snacking this whole month, and I think I was the only one who touched the pistachios. On other news: I found a new loser. This thing was finished years ago, but it wasn't until about a day or two ago that I fessed up to myself that this was, indeed, a true loser. In the beginning, it was all about the ingenious design. A knitted tube! A knitted tube with sleeves! One that's knit in the round, and then knit flat, and then knit in the round again! What genius! (Except it'll make you sweat like a pig with all that bunching up there under the arms. But that part is from memory. Try as I might, I forgot how to get the thing on.) We'll call it "The Rebecca, I forgot which Issue, Knitted Tube Nightmare in Elann.com Worsted Weight Don't-you-Dare-Wash Wool." N.B., this pic was taken before I finished the pistachios. Oh... but it looks good on you! yep, tubes are big big no nos....i knitted a tube and thought it was so chic but it is hard to be objective after all that knitting. stay away from tubes! merry xmas! A great big tube could end up a skirt, if you just can't let go of knitting it. Unless you're not friends with the knitted skirt, either. A smaller tube could be a neck-warmer or cowl, but you're in warm weather. Too bad, too, 'cuz the idea of knitting a tube can be so appealing and seems so wrong that it doesn't work out. Delurking to say that I love your Frontier Blues Jacket in the new Knitscene. Yeah. The knitting is for us. Yep, that's a loser. Even such a lovely stylin' gal as yourself cannot work that pair of tubes to advantage. I completely agree with you on the Christmas or any gift knitting. Which is why I don't knit anything for anybody as a "gift". I may knit you a pair of socks or a scarf or shawl but it's not a gift. I saw it, thought of you, and !# (flash! bang!) there it is. For you. I agree--gift knitting is all about us, not the recipient. I only knitting 2 gifts this year, and when I gave them to their recipients, both women were sufficiently amazed and thankful, but I was sure to tell them that the gifts were really all about me and my sanity--they just get to have the spoils. I managed to knit four (4!!!) holiday gifts, but, in my defense (1) I didn't plan on it; and (3) 3 of the 4 were the same thing (in different yarns) and really, really easy. The 4th was my first felted purse, and that was quick and easy. The Tube and rollerskates seem like a quirky prediliction. Only in Cali, baby. You are totally spot on. The holiday knitting...it is for us. I knit to stay sane...then I go insane because I have to knit. It's a catch 22. But I do it every year. I don't know if I can give it up. It's like knitting crack. I'm totally addicted. I tell myself I'm not going to do it anymore...and then give in and fail miserably. Is there a 12 step program? 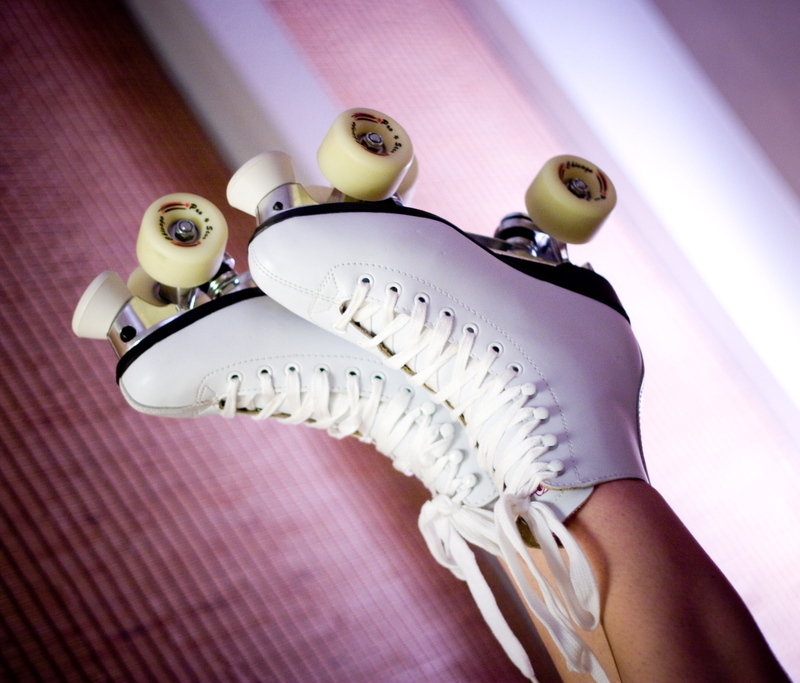 Time for a new Ravelry group: Roller-Sk8r Knitters!! Dude..I kept slightly burning batches of x-mas cookies that were supposed to be gifts and me and the DSB took it apon ourselves to eat the burnt ones...now my pj's (that were big and baggy) don't really fit me anymore....ugh I started my diet yesterday. HEY! Tubes were cool in the 90's - it's a skirt, no, it is a top, no, it's a wide belt, no it's a head band! Blame it on the 90's. What beautiful skates! I used to ice skate, so I can appreciate the boots, at least. Oh! I just thought up a way for a SoCal girl to wear sweaters! The ice rink! Tell me more about your skating adventures! Well, if you don't look good in a tube, no one will. How about calling it some kind of kitty environment/maze/toy/bed thingie. On the pistachio problem, depending upon how good a skater you are, you may be happy for a little more cushion on your keester. You write so well. It is a joy to read! I knit for other folks but on my schedule. If I make something and decide to give it away it is because the other person has expressed some great interest in said object. The skates bring back memories of Sat afternoons spent at the local skating rink. It was the first place I got to hold a boy's hand! Goosebumps! Well, count me out of your collective 'we' thanks. I've got skates, too - though not for Christmas. I used to do competition rollerskating - the same as on ice, but on wheels.